Join your neighbors for the second Wild Mile Community Meeting to provide feedback on designs for the Wild Mile Framework Plan. The goal of Wild Mile is to create a new park environment for (1) wildlife habitat, (2) recreation, (3) education, and more on the North Branch Canal. The area of focus is the Chicago River along the east side of Goose Island between Chicago Avenue and North Avenue. 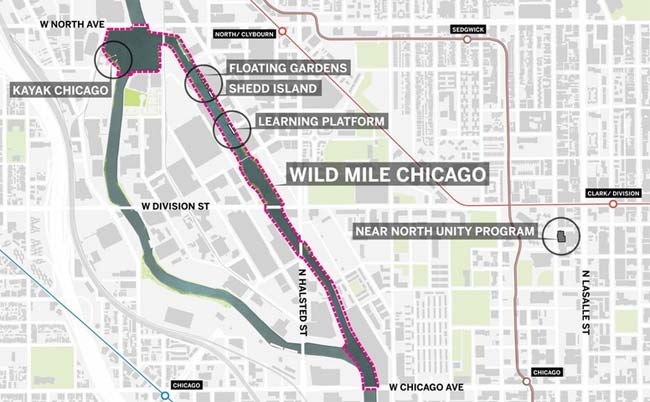 Your input will help direct the goals, priorities, and designs of Wild Mile Chicago! This meeting will be on Thursday, February 7, 2019 from 6:00 pm to 7:30 pm at the Cornerstone Center: Leslie Hall (1111 N. Wells St). For more information please visit this website.